The saying “Local Beer Tastes Better” is emblazoned across the back of a t-shirt at Blue Mountain Brewing Company. It’s hard to get excited about the love of micro-brewing around here. I’m starting to feel like this is less a philosophy and more of a way of life in Virginia. Each trip we have had to this area has included a visit to at least one local brewery. They have a passion for craft beer that I find unmatched. Most bars prides themselves in the area taps they have available. As we begin our way up the East Coast we are plotting out three landmark stops. Dogfish Head in Delaware, Magic Hat in Vermont and Flying Dog in Maryland; all built during the boom of craft beer and all amazing breweries. Most of you know we love craft beer, finding delicious and unique placed to imbibe. Visiting a real star of a brewpub makes for great memories. 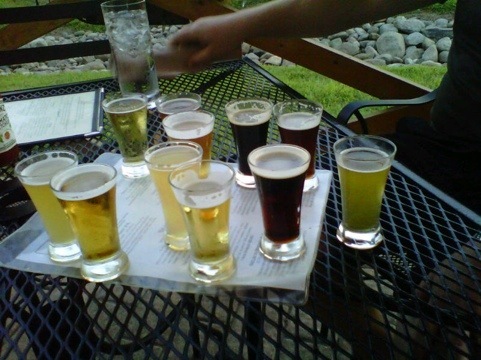 This entry was posted in Beer, Travel Tuesday and tagged Beer, blue mountain brewing company, Nellysford, Virginia. Bookmark the permalink. You’re near me and didn’t come visit???? Rut roh. PS I’d even soak up some suds with you. Hope you’re not drinking and driving!!! Our relos in VA seem to always have a beer in their hands….but don’t think it’s a boutique brew! Just a Bud.